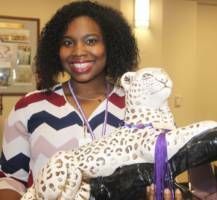 The Northwest Vista College Wildcat Award was bestowed upon Destiny Harper-Lane of Student Success. Jesse Harbert of the Math faculty and the previous Wildcat Award recipient said, “Since the day I received this award in mid-December, I started thinking of others who are just as deserving of it as I am. I wanted to pass it on to many others that same day I received it. Then, the thought of one bright star entered my mind. I have had the privilege of working alongside this individual in past semesters. She is so enthusiastic and eager to help with whatever students or fellow colleagues need to succeed in their individual roles. She has gone out of her way to communicate with professionalism, and to cooperate with kindness toward others in every capacity. She leads out in student orientations to make personal connections with students to see that they are prepared for their crucial first semester of college here at NVC. Her spirit has continually displayed the Wildcat Spirit.